When Volkswagen unveiled the XL1, the world like shocked. How could there be a car that only takes one liter of fuel for a distance of 100 km. Step VW is like pulling the trigger machine gun. Bullets ideas from other manufacturers scrambled to fight XL 1. Including Renault, the French manufacturing. Structured, massive and systematic, Renault join forces for dispensing an antithesis of the XL1. The result, exists a car named Renault Eolab. We had the opportunity to test this car in Ceram, Mortefontaine, France. Unlike the XL1, Eolab closer come true. If XL1 looks very futuristic and cabin capacity just for two people, Renault Eolab hathback shaped with four people capacity. Although still a concept, this car in the future is aimed at replacing the Renault Clio Eolab. This's why in terms of weight, shape, up to the performance of Renault Clio used as a 'benchmark'. 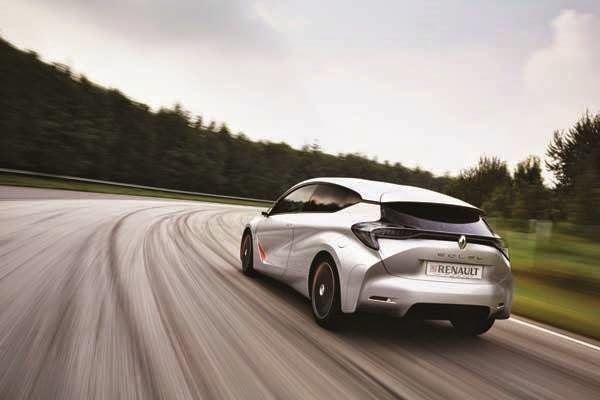 Renault Eolab have 100 technological innovation focused on three main aspects namely aerodynamics, light weight, and hybrid engines. For this car the biggest challenge is the combination of all three aspects or pillars that should have affordable prices. According to Jean Pierre Fouquet, Innovation Manager Hybrid PHEV ZE, Renault Eolab price will definitely economical. But compared with the Renault Clio today, of course, will be more expensive. "If Eolab went on sale, the owners will find that the operating costs of this car will be very cheap. Fuel consumption will be more efficient, you can save money, the car tax is also cheaper because it had the privilege of government, and 'giving back' as it is cumulatively would defeat the selling price, "he told us. Renault reduces the weight of the car by using exotic materials like magnesium roof, polycarbonate glass, and aluminum panels. Steel is still used for the protective structure at the front, bottom-pillars, sills and side parts of the car body. Renault Eolab exterior looks like water droplets. Renault reason, this form of better aerodynamics. Distance beneath the front, larger than the rear. Its grille composed of many hexagonal shaped protrusions. In the middle there is a large Renault logo. Thin strobes extends up the side of the fender. Bumper fused with grille. On the right side and the left bumper there is a gap for air flow. There are also water damp in the middle of the bumper. In addition to the car precisely at the bottom of the front door, there is a gap of air flow to circulate air in the car. The shape of the back is made with a small rear glass and rear lights futuristic. There is a pull of a line from the bottom side of the fender towards the middle of the trunk in order to split the airflow. If the shape looks futuristic exterior, the cabin looks normal. Steering wheel with a combination of white and gray. Dashboard, door trim two tone. Fourth white leather wrapped seats. The shape of the seat is made very futuristic at the same ergonomic. The instrument panel is small (approximately the size of a cell phone with a screen measuring 5.7 inches +/-) On the left side shows the info and info pace car, then on the right side serves as navigation. There are tablets with the task of presenting energy usage information and functions such as air conditioning and preferences car driving mode. The sitting position is lowered 50 mm and 115 mm approaching advanced engine room. This makes the low driving position and the like driving a sports car. Contra of a low driving position, the seat is made soft. Replaced rearview camera and displayed on a screen measuring 5.7 inches +/- inside the cabin near the pillar A.
Renault Eolab wear penumatik suspension with three modes height. The first mode for easy access in and out of the car. The second mode for urban driving. Third when running high dikecepatan. Eolab wearing a three-cylinder gasoline engine that has been modified Twingo belonging powered 75 hp peak. As a hybrid car, equipped with an electric motor powered Eolab maximum of 67.5 hp, as well as lithium-ion battery 6.7 kWh. Torque of the electric motor is very large, which is 200 Nm. If combined with a gasoline engine (95 Nm), the peak torque reaches 295 Nm. Eolab wearing a three-speed transmission without a clutch. No more transmission lever. Renault replace it with a knob marked PNDR located in the center console. How hasi test try? Did I press the start button. As well as hybrid cars, when the car is idle life in EV mode rely on batteries. Silent and no noise. Once the accelerator pedal in the press, a car drove up and produce a buzzing sound. Eolab wearing a three-speed transmission. Two teeth dedicated to drain power from the electric motor, while the gear is dedicated to drain power from the internal combustion engine / combustion engine. Eolab will run with power from the battery up to a speed of 40 km / h. Above that speed, the electric engine will be replaced with a gasoline engine. Smooth transition once. At first I was hesitant to press the acceleration pedal, know this car is still a concept. I'm afraid to ruin it. But curiosity forced me to try it. I press the pedal deeper and increased speed. When the speed reaches 70 km / h, the suspension down to 25 mm and an active spoiler down to 100 mm. Small wings on the rear bumper will appear to reduce turbulence. Still curious, I press the pedal deeper, power flowing from the gasoline engine to the front wheels, the maximum speed increased to 120 km / h. This dikecepatan Eolab move swiftly like a small hatchback. Because tested on the track, then I accidentally treat it like a production car. Tire tread often curbs when cutting corners / racing line. 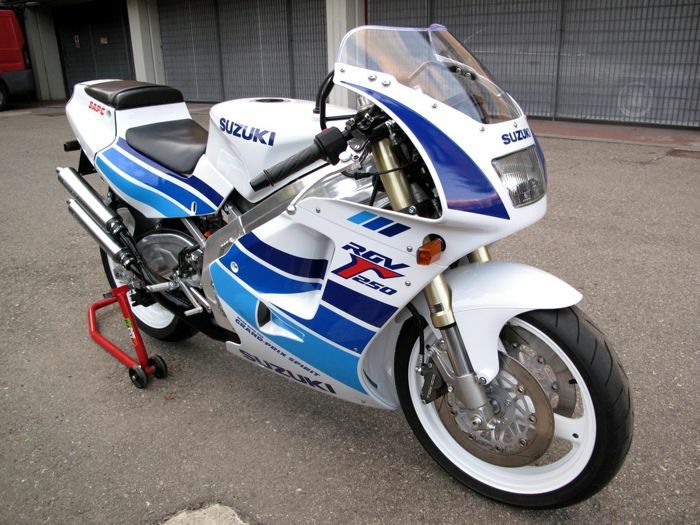 As a result, the suspension absorbs shock and vibration pneumatiknya well. When cornering hard, produced very good grip. Steering response is also very good. It feels just like Clio. What does it mean? 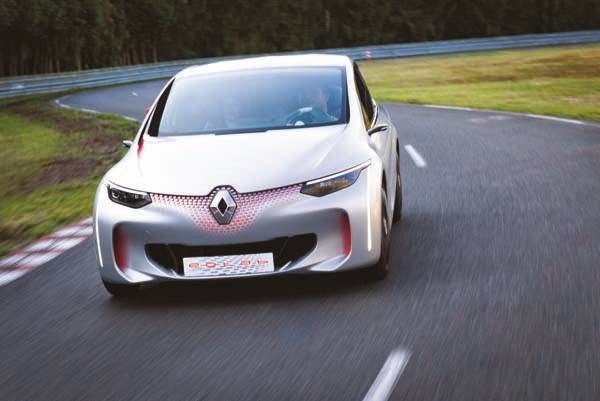 Renault has managed to keep the pleasure of driving in Eolab like Clio. Unfortunately we were not able to test the acceleration 0-100 km / h. But Renault claims, acceleration 0-100 km / h to 9 seconds. This high dikecepatan we very much enjoyed Eolab. No exaggeration if one tries Eolab will poison your mind. Our new shortage is that during the transition from the gear shift three-speed transmission that has been patented Renault. The result is not smooth. Still feels very annoying pause. Similarly, when the engine brake. Buzzing and the procession was still disturbing. When the driving test is finished, I took time to inquire about hybrid mode Eolab to a technician. I complained about the gearshift. "It's still in the development stage. When it is finished it will be as smooth transfer of dual-clutch transmission, "he said. I also complained about the fuel consumption of a hybrid ideal can never be achieved when driving on the freeway. The point would be wasteful as well. Renault engineers asked, why is that? I replied, when driving at high speeds, the gasoline engine will function, and the electric motor will die. It certainly wasteful of fuel, and occurs in hybrid cars we've tested previously. Answer technician is unsatisfactory and he confirmed my claim about the fuel consumption. "Hybrid is not a solution to the highway," it said. I then approached the Jean Pierre Fouquet, ZE Hybrid PHEV Innovation Manager. I asked the same thing. After a lengthy explanation, I asked. Why not make the Renault EV mode for high-speed electric cars? That is the condition of the freeway on the highway will not spend fuel. Apparently, Renault already have this solution. However, it has not been applied in Eolab. Later Eolab will have EV mode from 0-125 km / h. At a speed of 125 km / h will be lit petrol engine to charge the battery up to a speed of 150 km / h.
Finally we understand all the existing deficiencies, and makes us realize how realistic this concept. Weaknesses that arise solely because the car is not a production version. If all technical barriers completed, Renault Eolab will be supermini or small hatchback interesting both from the view to the performance.